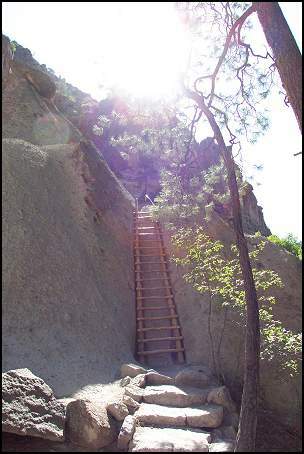 Not far from Santa Fe and Los Alamos, New Mexico, is one of my favorite places to visit - the Bandelier National Monument. 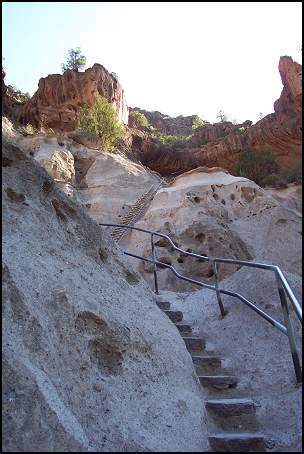 The Frijoles canyon runs the length of the park and is loaded with many interesting things to see. 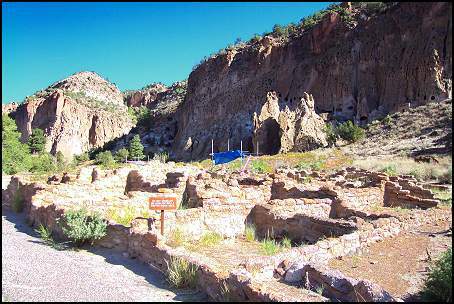 There are several different pueblo-type ruins, and a number of dwellings carved into the solidified volcanic ash (known as "tuff") that comprise the nearly cliffs. 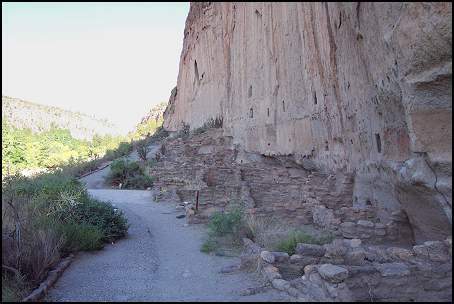 One of the first things you see when you enter are the Tyuonyi ruins, the remains of a huge pueblo settlement. At its height from 1100 AD - 1300 AD, several hundred people lived, farmed and traded here with neighbors as far south as Central America and Baja California. 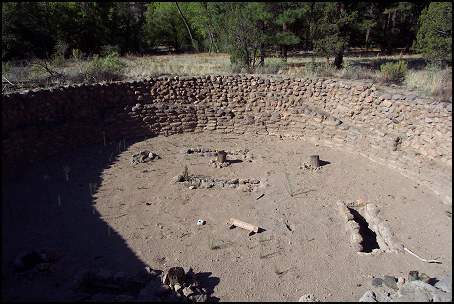 This is a close-up of the common area of the village, with ceremonial kivas built into the ground. 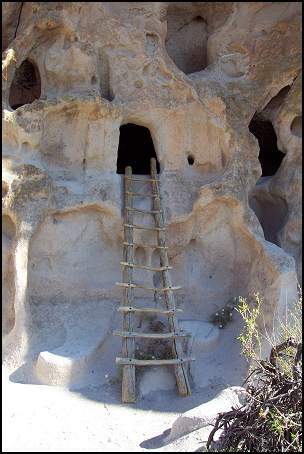 Some of the cliff dwellings in Bandelier are accessible and open to the public. Scientists speculate that two enormous volcanic eruptions, 1.1 and 1.4 million years ago, ejected over 200 cubic miles of volcanic ash over the area. The resulting compressed ash is quite porous and easy to carve. This is a view of the Long House ruins. 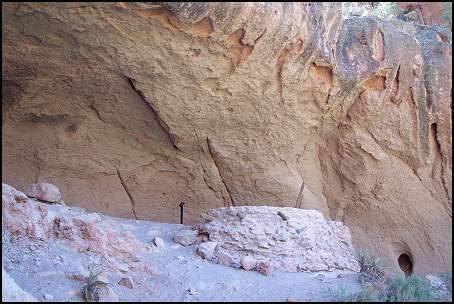 There is an amazing ceremonial kiva built into the surrounding pink sandstone cliffs. You can climb up to it, through a series of 5 ladders and sculpted steps. 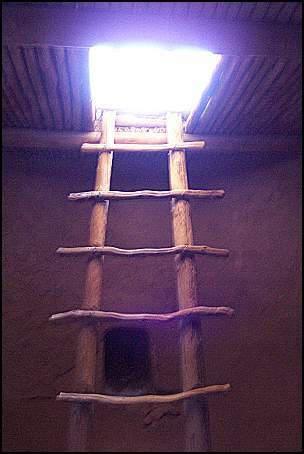 Once you get to the kiva, about 140 feet above the forest floor, there is a chamber built into the ground where religious ceremonies took place. The chamber was supposed to represent the womb of Mother Earth, and one can only imagine the magic and the wonders that happened here. I think the one thing that continually amazes and intrigues me about Bandelier National Monument is the constant interplay of color that you see everywhere. 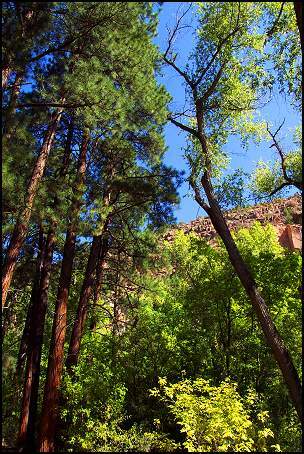 The turquoise sky, the green of the trees, the yellow sunlight, and the amazing orange-pink light reflecting from the sandstone cliffs which line the valley, all combine in a magical way unique to New Mexico. 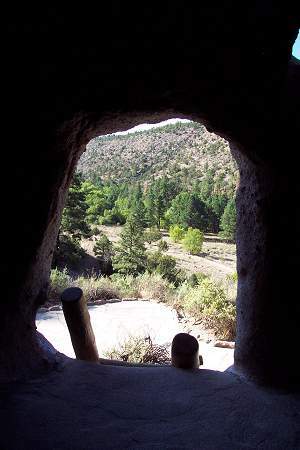 Bandelier is a wonderful place to visit, and I would recommend it to all.